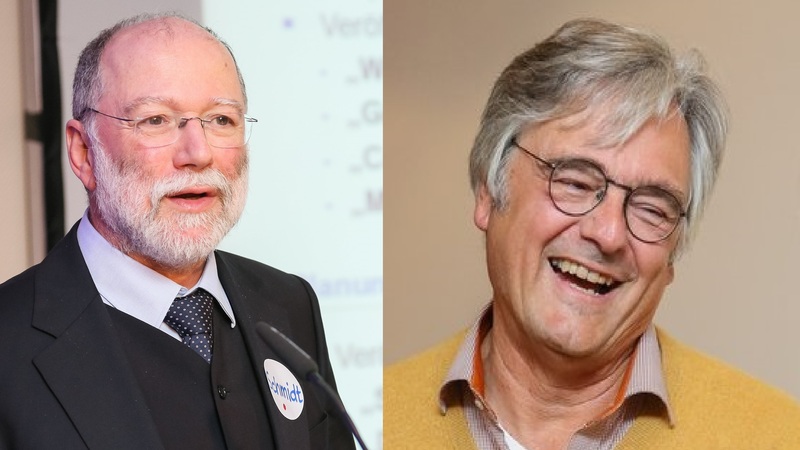 After 17 years, Dr. Herwig R. Friedag (right) and Dr. Walter Schmidt (left) handed over the organization of the ICV conference “Controlling Innovation Berlin – CIB”. We talked to them about this. What motivated you to do that? (Friedag) There are two factors: Firstly, after 17 years “running out of air”, old people (67) also want to experience some New. Secondly, we want to give young people the chance to organize an event of this scale themselves; you can learn a lot this way! The CIB has developed in more than 17 years. How do you see the Berlin ICV conference today? (Friedag) Initially, it was primarily about compensating for the economically catastrophic start of the first event; In the meantime, we have achieved a total surplus of more than 40,000 EUR – for the benefit of all ICV members! The topics have not changed actually, they were always target group specific. Of course, 17 years ago, there was nothing on start-ups, Big Data, etc. (Schmidt) But it was and still is mainly about the people behind the numbers today. About designing their cooperation in the context of promising business models. (Friedag) A great success is the Controlling Newcomer Award. Based on the experience that almost any professor knew the ICV 17 years ago, in 2005 we developed the Controlling Newcomer Award, which involves controlling professors or their chairs. Since then, more and more chairs are joining in and submitting their best theses, also in English. And we have more and more competitors. You have many experiences from this regional conference. Which tips for the ICV event organizers would you like to share? What has proven itself? … and what mistakes should others rather not repeat? (Friedag) We tried too few new things. As many events, the CIB is as it was ten years ago. You have to dare to make changes and experiments – even if it sometimes does not succeed (as in 2017: finger food instead of classic food). Anyone who does not try new things will eventually lose the connection – as in normal life! In 2017, the 17th CIB took place. Can you still remember the first CIBs, what is especially worth keeping in mind? (Schmidt) At the turn of the millennium, there were a lot of changes in controlling. We had hot discussions in the work group Berlin-Brandenburg and also with the other work groups of the region Germany East. We wanted to contribute to the renewal in the International Association of Controllers. And it should be something innovative. Hence the name “Controlling Innovation Berlin” (CIB) and also the motto of the first conference: “With e-Controlling into the New Millenium”. We were thus pioneers in the ICV. We are still proud of that today. At the 16th CIB we repeated the topic in a modern way: Digitalization – networking – start up and its consequences for modern controlling. Which highlights from the 17-year history of CIB are especially worth telling? (Schmidt) We picked up on controversial discussions early on. „Beyond Budgeting”, the implications of International Financial Reporting Standards (IFRS), globalization, behavioral controlling, sustainability and ethics, etc. Throughout the years, we remained faithful to our line of innovation and inspiration. Highlights were a series of special speeches, e.g. by Albrecht Deyhle on the 3rd CIB, by Rolf Hichert on the 5th CIB or by Siegfried Gänßlen on the 9th and 15th CIB. The tradition of ending each CIB with a speech by a trainer of the Controller Academy has proved itself. What has changed the most over the 17 years in controlling and the ICV? (Friedag) Some people think that controllers are becoming consumers more and more. But from our experience, we can say that this is not the case: you just have to address people; most of them are happy when they can become active for a good cause. (Schmidt) In terms of content, controlling has become more humane. We are starting to free ourselves from the corset of financial figures and to put people’s cooperation in the center of our activities in the framework of promising business models. We are beginning to realize that our job is not about maximizing profits, but about maintaining or improving the positioning of our companies in the markets of the world. To do this, we need to be less calculating, but above all we need to drive forward development, communication, implementation and financing appropriate strategies. Especially in the upheavals of today, it means a lot of work for us in this regard! Last question: This is not a goodbye to the ICV. Which tasks will you continue in the ICV in the future? (Friedag) On the one hand, “my” international ICV work group “International Work Group” is very important to me. There I am now in the management board, after I handed over the WG leadership to my colleague Romina Oreskovic. On the other hand, I am now more involved in Poland, where the ICV work has fallen asleep a bit… Let’s see how this develops; I am in good spirits! (Schmidt) After initiating and accompanying the establishment of a number of ICV expert work groups, I will be putting the work of the Delegate for Expert Work Groups in younger hands. Just like I already did in the Board. But I will continue to serve as an Executive Advisor to the work groups. I will also be available for the Board for speeches or small workshops if they invite me. I’m going to remain an active member in five different work groups until further notice. And I’m still responsible for the ICV publication series for some time. So it does not get boring. I don’t think about saying goodbye.